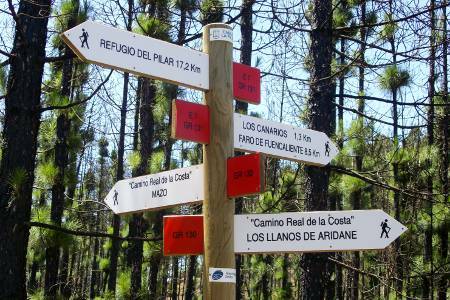 The whole network of hiking trails on the island comes to over 1,000 km, and between them they pass through just about every kind of scenery on the island: lava fields, pine forests, lush laurel forests, farmland and village centres. Some are very short, but this small islands has two long distance paths. The GR 131 runs in a giant question mark from Puerto Tazacorte, up around the Caldera rim, past the Roque, and down the central ridge of the island to the southern tip. Super-fit athletes can run it in a day as an ultramarathon, but normal walkers take at least three days. The GR130 runs right around the island, between sea-level and 1,000 m, which includes a wonderful variety of landscapes. Someone well used to hiking takes about a week. I’m doing it in much smaller installments, but I’m loving it.